Today is the Death Anniversary of Late Bhagat Chhajju Ram Ji, who left this mortal World on this day 22.05.1989. Born on 07.03. 1907, he lived and served the humanity particularly in J&K state as Hon'ble member Praja Sabha before 1947; MLA R.S. Pura; MLA Bishanah; Hon'ble Cabinet Minister; MLC; President, Pradesh Congress Committee Jammu & Kashmir. Popularly known as "रियासती गाँधी", he followed the Gandhian Philosophy throughout his life, lived a simple life and always believed in simple living and high thinking. He was eldest of the three siblings: one brother and one sister. He lost his father when he was a young boy and had to quit his studies in 8th class to take care of the younger siblings at the tender age of 14 years. He learnt the vocation of tailoring to feed them and his mother. He was studying in Lahore when his father died. Later on, he started a cloth shop in R S Pura in which Lala Karam Chand Arora whom he invited to join as a partner. It was necessitated with his growing involvement with social awakening programmes. 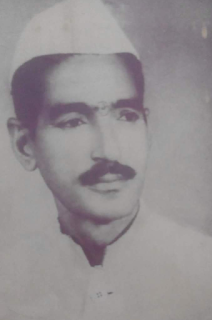 He started his social journey from Arya Samaj.He had joined the Arya Samaj in Lahore and was working in Jammu in close liasion with Lal Hans Raj Mahajan ( of famous Mahajan Sports of Jalandhar , then at Lahore). Arya Samaj Movement especially against UNTOUCHABILITY and CASTEISM owes much to Bhagat Sahib. He lead the Arya Samaj in cohesing the society to rid it of the social evils existing in the sociaety particularly Hindus. He was instrumental in establishing Ary Samaj at R S Pura and Arya Samaj Mandir at Shastri Nagar (Gandhi Nagar). On Socio-Political Front, he started his journey by forming MEGH MANDAL which primarily worked among the the huge majority of Megh community in Jammu and surrounding areas for their social and political amelioration and emancipation. He used to hold social gathering delivering lectures and exhorting people for education, Popularly known as"Yag" community kitchen was usually organised on such assemblies. A voracious and interestingly wonderful speaker, he was. His speeches were a mount of wits to which people listened passionately with pin drop silence and heart full laughter. He was a staunch follower of Kabir Sahib and established Kabir Kalyan Kendra at Jhiri Kahnachak as an excellent centre for social development. He had founded a social magazine "KABIR SANDESH" to spread the teachings of Kabir Sahib. He was the ideologue and patron of the Sant Kabir movement in J&K and patronised the organisation of ever first Kabir Sabha Bishnah in 1980. He was the the campaign manager of election of Mufti Mohmmad Sayyad as MLA from R S Pura, who won ever from Jammu in1986. He was a Friend, Philosopher and Guide. He had established a trust " Bhagat Chhajju Ram Trust " for social service especially for the sick, destitute and infirm to whom mrdicines were distributed every month. He did not own a house, have a fast conveyance like car all his life and lived in rented accommodation. Sheikh Mohd. Abdullah the then H'ble Chief Minister knowing that Bhagat chhajju Ram did not a house allot a govt. accommodation to him till he survives. We remember him from the core of heart and pay our homage.